HOW "WE" STARTED WRITING "MY TRUTH"
I was sitting on an airplane bound for a four day retreat hosted by English medium Robert Brown in the Bahamas early April 2003. Robert's book "We Are Eternal" just published and in it was a story about my dog Larry and the love from Spirit that produced his bark during a sitting October 2000. Writing my own book with Spirit while I researched the history of my family lines of the Douglases and the Lovaines as I have been doing these last six months had given me little time to read others' books. This flight would give me "free" time from Spirit's work to leisurely enjoy reading�or so I thought. So here I am on the plane reading Suzane Northrop�s book "Everything Happens For A Reason"�and there beginning on page 254 was my story of my first contact with Larry from the "other side" during a small group seminar with Suzane in Boston! Imagine, my wonderful Larry was now published in two books by two great mediums at the same time!!! And it was because of Larry I was introduced to Spirit in 2000. My book "My Truth Lies in the Ruins" is a direct result of that love from Spirit and the effort from the loved ones on other side that has led me on an incredible journey. 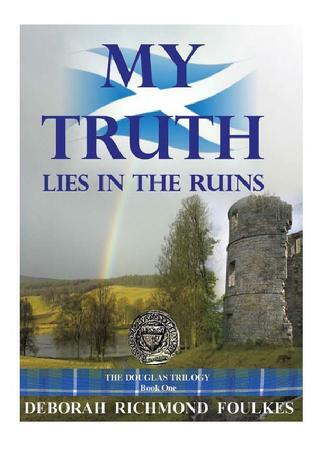 "My Truth Lies in the Ruins" is a book about the lives of William le Hardi Douglas, his wife Eleanora Lovaine Douglas and their children in medieval Scotland; a history of lives spanning the years 1250-1302. It is strangely enough also a story of eternal love and Spirit: my guide in Spirit has revealed himself to be William le Hardi Douglas. And over the past three years in my meditations and spiritual visions I have been told that I was related to him as a descendant, which I have corroborated; knowing now that we can travel in the same soul group. I was also told that I was his wife in Scotland many times, including 1288; this was very overwhelming information and difficult to accept. But I decided to "trust in the process"; I would get information and then verify it through documents and records. Everything became more in depth with every step; records were unavailable in most cases having been destroyed in the Wars for National Independence in Scotland. But I would get bits and pieces through books I purchased; chance information from some Essex and Hertfordshire research centers; and the Pipe Rolls referencing others� activities that were entwined with the Douglases and Lovaines. The story was unfolding through Spirits� words and guidance in my work; then verified to me through real documents and primary records. Writing this book with Spirit became a labor of love for me. I was coming up with many validations and strange twists and turns. I was getting poetry and lists of personal ethics from le Hardi. I was "seeing events" while lying in bed in the early hours of the morning. Then I would read the historical narration and find discrepancies; these faults I could set aside when I finally pieced together different narrations where each chronicler had half the story. Putting the pieces of the puzzle together was a real chore; but it proved to me that my information was accurate. My only drawback in this work: I was concerned that perhaps "it was all in my head"; that the information was from my own words not Spirits�. So I went to several well respected and well tested mediums for confirmation. I knew I was receiving proof of Spirit in other areas because I was sitting in Spirit development circles in Boston and in some classes at Arthur Findlay College at Stansted, England; a location only eight miles from where Eleanora Lovaine grew up. I knew I was getting information for others and giving messages in these situations as students validated my "readings." My real concern, in truth my ego�s concern, was the identity of my guide: no one else had a guide that said he was their husband in other lives! I was "fearful" that I was very, very wrong, forgetting in my doubting times that the work I was doing was not about me or my ego. I kept myself going, saying to myself... "it is not about me...trust the process." My first reading was with Lydia Clar in November 1999. I got her name out of the back of John Edward's book, "One Last Time". She immediately brought through a daughter; I had no children in this lifetime. But Lydia insisted and over the years other mediums also brought through Martha Douglas who drowned in the moat of the Woodham Ferrers Hall, a 13th century manor held by Eleanora Lovaine. In October 2000 I had a taped reading with Robert Brown. During the sitting in a NY hotel where dogs were not permitted, we heard and recorded a strange barking sound; Larry, Lawrence Booboobear using his Sunday name, had come through using Direct Voice. Robert included the story of this event in his book,"We Are Eternal". In May 2001 I had a reading with well known Boston Medium and Spirit Artist Rita Berkowitz, author of two books including 'Empowering Your Life with Angels'. 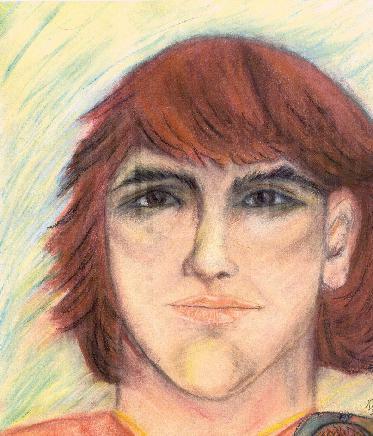 She actually drew the image of my guide William; the eyes were identical to the ones I saw, that I was now sure I was not just dreaming him up: someone else was "seeing" him. William came through as an Egyptian Palace Guard. That validation was very comforting. And in September, just days after 9-11 John Holland gave me a reading where William came through, loud and clear, also revealing himself as an Egyptian, just as he had done so for Rita. In November 2001 I was gravely ill with severe asthma. I asked my guides William and Ana my healer in Spirit to help cure me. William encouraged me to study Reiki. I became a Reiki Master, working with Energy and Healing. My asthma all but vanished. In the next six months I went from 17 daily medications at very high doses including 40 mg of Prednisone daily, down to just three prescriptions and all at normal, lower dosage amounts and no steroids. Now with better health I was ready for the next challenge: unemployment and a book to write. In early March 2002 I was at Stansted Hall at the Arthur Findlay College; a school operated by the Spiritualist's National Union. On "weepy Wednesday" as they call it at Stansted I received a "spiritual vision" that was confirmed the next day in a reading with trance Medium Muriel Tennant. The vision and information that was confirmed included facts about my early childhood, my guide William�s identity and the past relationships with my guide in many lifetimes, plus the strange fact that I was also his descendant in this life as well; pretty intense information for a sitting with a medium who didn�t know me and one I had never heard of before coming to Stansted. In June 2002 I found an old book my mother gave me on her family just before she crossed over. This family was intertwined with nobility, a direct descendant of noblity of both Flemish and Norman extraction in England as well as in Scotland in the 12th century. I discovered the ties with the Ferrers family and the Lovaine families; all related to my 13th century family in "My Truth." Now I had another link to the Douglases and my guide as his descendant from that era. I was only "thinking" of writing a book at that time when I received some great encouragement from some friends I met in Scotland while I was researching the Douglas Clan. I was getting confirmation in every manner of the word; and from the strangest of places. I knew it was the work of Spirit. But I was still "afraid," my ego still ruled the day. In late September 2002 I received another validation message during a s�ance in Boston with Suzane Northrop. In that session William again came through, this time with his first wife Elizabeth and their son James, a young man Eleanora raised. William said through the medium: '"I died in your arms', he wants you to know that he died in your arms," Suzane told me. A strange message to some, but not to me...I had just received information from Spirit on William�s death in 1298 in the Tower of London; this wording was perfect confirmation. James Douglas came through: my name is James. James, he repeated and she reiterated that he wants to be known as "James". Again the information was succinct and accurate. James was not "Jamie" as the well known historian Barbour called him; confirming what James had told me directly in meditation when I was planning a trip to Edinburgh later in the year for a reenactment performance of his life as the Good Sir James, the Black Douglas. Later in November when I visited the castle in Scotland I heard his words again:"I was never Jamie; please let them know that". I was again at Stansted in October, receiving yet another reading with a wonderful Scottish medium I had never met before. In the Spiritualist circles a medium must pass several tests to be certified as a medium bringing proof of Spirit. She was Maureen Harrison Skinner from Aberdeenshire. She gave me the most beautiful reading from someone in Spirit that I could have only dreamed about. Maureen described William perfectly: in physical appearance, his mannerisms, his integrity and intelligence, and of his personality in general as I know him. He was poignant and the reading was very evidential of my meditations and very detailed about some information he gave me for the book. She gasped when I showed her my Spirit drawing that I did the month earlier: "That is the man standing behind you, that�s him!" she said. I had never drawn or painted until last summer; some examples of that work are on my the book's web site. I was clearly being led on a path of discovery. By February 2003 I was half way through the writing of My Truth; but I wanted to have confirmation that my book was real; that I was receiving the information correctly. I didn�t doubt Spirit, I doubted myself and my ability to receive information accurately. I had several examples from William that renowned historians had been absolutely wrong about. And from research that Spirit led me through�of real documents on record in the Public Records Office in England and in the Rolls of the Pipe, I found substantial evidence to back what my guide William told me was true and refute these previously "accepted authorities". I had another sitting with Robert Brown in New York in February. He confirmed that my book was valid; though he was not aware I was writing a book�it was a "new way" that Spirit was using to "disseminate information" to this physical realm I was told. Every thing was coming together; I was learning to trust the process. And at the very end of the reading he said, "I see a woman named Eleanora, wearing a white veil like Lady Marion of Robin Hood's times." Incredible validation once again. The messages and validations kept on coming. At Omega in NY in the fall of 2006 , during a Demonstration of Spirit Communication I got a public reading with Suzane Northrop. "I have your daughter here that drowned and her big grey dog." Larry and Martha Douglas were coming through together. In 2007 I was at another Demonstration of Spirit Communication in RI with Rita Berkowitz and Suzane Northrop. Rita brought in Thomas Lovaine and drew him from his more recent incarnation as Edward Bailey, a 9-11 victim. Suzane opened the second 'show' and brought him through again with James and Archibald, sons of Eleanora Lovaine, nephews of Thomas Lovaine. Through this website I am able to share my story with thousands of people on similar journeys. And to think that all this work on the book "My Truth Lies in the Ruins" began with Larry's passing. It is indeed a leap of faith to publicly link the well researched historical novel on the lives of the William le Hardi Douglas, his wife Eleanora Lovaine Douglas, and their children with work with Spirit. My fears seemed real: that my research would be invalidated because of the way I received the original information that I corroborated by primary sources of research, and pieced together like parts of the puzzle into a book on the Douglases. Whew! A whole lot of ego in those words. Are my fears valid; is it really a leap of faith to reveal the true sources of my information? No. It occured to me, finally, that fear is ego talking, raising its silly head. All along the book was really substantiating the power of Spirit�s love, not my credibility as a researcher. It was about proving that we do survive the change called death, over and over again. "This humble knight knows only to follow his truth; God�s own truth within him, held here in his heart"....This is my truth, it is Spirit�s truth; it is all our truth....it is all the same truth. Deborah Richmond Foulkes. P.S. In May 2008 I attended the Robert Brown Retreat at Virginia Beach, VA. John Edward shared the stage one night with Robert to do some Gallery Readings. He came to me and validated my husband William, my son Archibald Douglas who later revealed himself as a USMC 2nd Lt. who died in 1968 in Vietnam, Martha Douglas who drowned in 1294 and my Larry..."I have a cartoon character here," John said. Lawrence Booboobear...How fitting is that! Please click on the image above to access the web site for our book, My Truth Lies in the Ruins.